Last year, at the Artists & Makers Christmas fair (THE must-go Christmas fair in Lewes (on December 5 this year) because a percentage of takings go to Western Road Community Primary School and I’m biased because it’s where my son goes), I rushed around the Town Hall with a ripping hangover from my studio Christmas party the night before, and bought precisely nothing – even though I wanted to buy everything. But then I spotted someone packing up what looked like a table of mossy items – the last thing being a wreath that looked like it had been laced together by the mice of Brambly Hedge. I (somewhat still semi-drunkenly) asked for her details and then got in touch after the event about having a wreath of my own, and ended up with an amazing handmade hedgerow Christmas creation delivered straight to my door for a very unprincely sum. The wreath gathered comments and had me stopping to admire it every time I opened the front door. It was so very pretty, so very seasonal, so very local, so very…foraged. I started following Kate Taylor on Instagram. She’s a gardener who spends the winter gathering beautiful treasures from nature from the hedgerows around these parts and then making ‘winter wreaths’ for Christmas or winter solstice (this year December 22). Her little business is called ‘petalsrperfect’ (and aren’t they just?) and I remembered and sought her out about a week ago and asked if I could write about her for Little Lewes. I think for what they are, these wreaths are so reasonable and unique, I really wanted to share them with the blog’s readers. This is JUST the kind of local business I like to see really thrive, especially when its moment to shine is so fleeting in the course of the year. Kate makes the wreaths to order and you don’t quite know what you’re going to get (well, I have stipulated the red and white ribbon you see in the picture here because it’s so pretty) and I think there’s something really nice about that – let nature to the job of selecting. Each wreath is decorated with natural seed heads, and injections of things like lotus pods and hydrangeas, and Kate takes all her inspiration from the hedgerows and her love of winter, working to create something totally unique every time. Each is made to order, so they’re entirely fresh, and will often last well into the new year, when people turn them into bird feeders (awwww). So when should you order? Kate is taking requests by email or phone and wreaths can be made available from tomorrow, December 1. 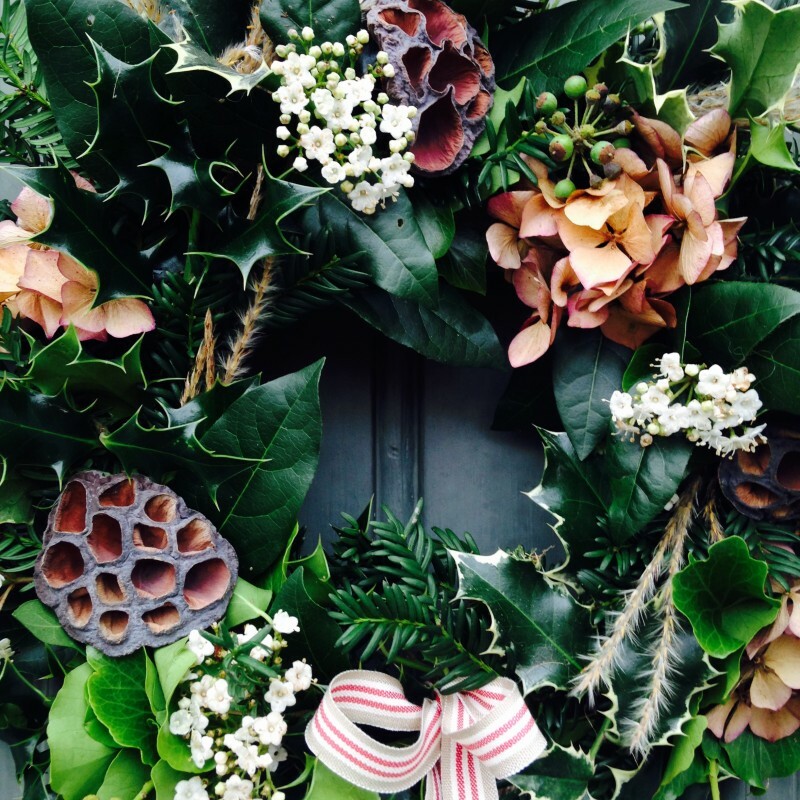 She will be spending the day of December 19 delivering orders around Lewes and its surrounds at no charge though, so if you’d like your wreath delivered direct to your door – and more likely to last through Christmas and into 2016 – contact her before that date to be included. Collections are otherwise welcome from her home in Lewes. To care for the wreaths, make them last and keep them looking fresh, it’s worth knowing that in dry spells they like a bit of misting, as you would a plant. This’ll keep your wreath looking fresh and lasting longer. Disclosure: I contacted Kate Taylor of petalsrperfect through Instagram about a week ago as I wanted to write about her. She offered to make me a wreath for no charge in return – which wasn’t expected but was gratefully accepted. Kate has kindly agreed to donate £15 to The UN Refugee Agency, which will be receiving donations throughout December via Little Lewes. To find out more about that, read this. Oh those are just gorgeous. Each year I go along to a class to make one, I love having a real wreath on the door. These are so unusual though, and I love the fact that they are more winter than Christmas.